Bar Harbor is a village on Mount Desert Island that's extremely popular with tourists. With a few interesting museums, parks, and educational centres, the town is the perfect destination for a great weekend getaway in Maine. 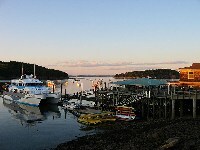 Popular activities include golf, whale-watching, sailing, hiking, and kayaking. The shops and restaurants in Bar Harbor are on the pricey side, but offer excellent selection and quality. Beer aficionados will also enjoy sampling the brews from Bar Harbor's three microbreweries. Bar Harbor is located near Acadia National Park, and makes a great base for exploring the spectacular scenery, especially in autumn.